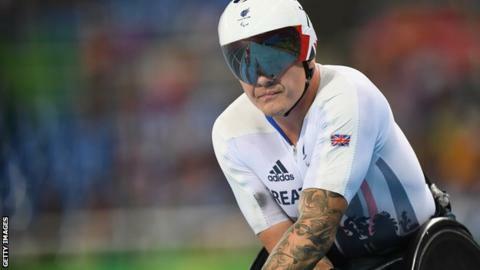 Six-time Paralympic champion David Weir says he is "gutted" about missing his son's birth after missing out on track medals in Rio. Weir, 37, missed the birth of his fourth child to compete in Rio and said on Twitter he had "let the country and my team-mates down". Londoner Weir was unable to explain his loss of form, saying: "I don't know what has gone wrong out here." The tweet, however, prompted a deluge of support from fans and well-wishers. "I came out to Rio with every intention of getting a medal," he added. "My training was amazing, I felt fit and strong and was ready for Rio. "Representing my country means everything to me and I always want to perform at my ultimate best but that's just not happened this Paralympics." Weir had announced he was to retire from the track after Rio. He will still be competing in the marathon - including the one in Rio on Sunday - and said he may make himself available for the T53/54 4x400m relay team. The 37-year-old finished sixth in the T54 800m - his final individual track race at Rio 2016 - after coming fifth in the 400m and fourth in the 1500m.